Your car stereo is unable to produce the best sound quality without an amplifier. This is the reason why buying the best best amplifier for your vehicle is a plus. Whether you are looking for subwoofers or 6.5-inch speakers, quality is paramount. Power is just one thing to look for in the best car amps. You also have to guarantee that a clear and clean music will be generated by your stereo. A high-performance component can only be identified given you have evaluated it carefully. Begin your selection by having a list of top rated and most reliable amplifiers. Afterward, concentrate on the guidelines in verifying the quality of a product and tips in using the units. This mono-channel amplifier is packaged with a remote control for subwoofer level. It produces 1,100 watts of maximum power. The amplifier also has both low and high-level inputs. This unit measures 9.125 inches by 10.4375 inches by 2.25 inches. The cumulative weight of the system is just 4.8 pounds. BOSS Audio R110M Riot Monoblock is designed with a switchable bass booster and variable low pass crossover. If you want to ramp up your vehicle with enhanced sound performance, this is a highly considerable system. Apart from the aforementioned components, it also has metal oxide semiconductor field-effect transistors (MOSFET) and class AB circuitry. With its MOSFET feature, you can guarantee high-efficient sound generation. Distortion will also be eliminated with the specific linear circuitry of the amplifier. Powering up subwoofers and speakers is done seamlessly by the BOSS Audio R110M Riot Monoblock using its 2 ohm high and low level inputs. Frequencies can be managed more effectively with its variable low pass filter. For better sound experience, you may use its bass booster that could add up to 18 decibels (db) to your existing low bass. For protection, BOSS Audio added a short protection feature. Once the system overheats, shorts will be avoided instantly given failure of speakers to be put on halt. Its input has the capability to match the head unit’s output signal for optimal performance provided you adjust it appropriately. This is a high-quality, class D amplifier that is rated at 500 watts by 1 Channel @ 2 Ohms RMS. It also features a power supply with MOSFET technology. Customers can have decent quality guarantee from this product since it is compliant to CEA-2006 standard. Rockford Fosgate R500X1D Prime One Channel Amplifier is also designed with RCA pass-thru outputs. Its crossover feature is supported by 12 db/ octave Butterworth technology. You can use its punch level control (PLC) remotely. The phase switch of the unit is either zero degree or 180 degrees. For overall protection from extreme heat, it comes with a power supply thermal sensor and real time output assistance. Rockford Fosgate R500X1D Prime One Channel Amplifier has often enlisted among the best due to the reputation of its provider. Since then, Rockford Fosgate has been developing high performance and high quality mobile audio products. All products are designed and manufactured using technologies under the brand. The differential input of the one channel amplifier eliminates excess distortion and sound interference, which could be transferred by the input wires. Conclusively, the high-end components and uniformity of its features result to minimal distortion, better heat distribution, high power generation, and long-term service. If you are looking for a simple yet powerful audio system for your vehicle without spending too much, this product is the one for you. This four-channel amplifier comes with a class D circuitry.It is designed with a power output of 400 watts. RMS power rating of the car amplifier is 4 ohms, which is equivalent to 45 watts by 4 channels. This amplifier measures 5.5 inches by 3.5 inches by 1.3 inches. Aside from cars and land-based vehicles, Kenwood KAC-M1804 Four Channel Amplifier is suitable even for marine environments. Unlike other amplifiers, it has a heat sink case extruding from the main device for better overheating protection. Kenwood KAC-M1804 Four Channel Amplifier also comes with RCA inputs, which are intended for speakers located in the front and rear areas of your car. Although it promises a top quality sound generation, it does not have high pass filters. It does not produce much sound, but will work to enhance your basic stereo audio. It has a compact design, giving you no worries in fitments on any dashboard. You may only need little shelf brackets to connect the unit to the existing mounting screw. The installation, regardless of less support from the manufacturer, is pretty basic. The wires are also color-coded to make the task hassle-free. It is also packaged with different extra lengths of cables, zip ties, and mounting screws for securing the unit in place. In terms of price, it may be still be a considerable buy. This two channel amplifier has a maximum power of 2,000 watts. This is equivalent to 750 watts by 2 RMS at 2 ohms, 375 watts by 2 RMS at 4 ohms, and 1,500 watts by 1 RMS bridged at 4 ohms. It has a full range circuitry of class AB. Similar to its rivals, it has MOSFET power supply for overheating resistance. Planet Audio AC2000.2 Anarchy Two Channel Amplifier is available with high and low-level inputs. Besides, you will find variable bass boost, low pass crossover and high pass crossover in this amplifier. If you want to control your existing subwoofers, this package also comes with a remote that could help. Since MOSFET technology is used in the amplifier, you could instantly change to non-conduction from full conduction with this unit. The class AB circuitry is also a certainty that there will be upgraded efficiency and eliminated distortion. Customizing your sound experience is much easier with its controls. If you want to obtain more flexibility and more power, you may utilize its bridge channels. Its variable low pass filter provides control on the subwoofer-passing frequencies. Alternatively, the high pass filter will allow you to manage the frequencies going through your full range speakers. If you are worrying about low bass, do not be for this amplifier comes with a variable bass boost feature. Superior and tailored sound is easily obtainable with the Planet Audio AC2000.2 Anarchy Two Channel Amplifier. This is introduced as a power-packed amplifier with class D circuitry. The design of the amplifier is compact for aftermarket and factory speakers or subwoofers. This unit measures 9.2 inches by 7.5 inches by 3.2 inches. Alpine KTP-445U Four Channel Amplifier is designed with a universal plug that allows you to transmit signal from RCA inputs or cables for speakers. It is also CEA-2006 compliant with a rating of 45 watts RMS by four speakers at 4 ohms. This product is an upgrade of the universal power pack under the brand. When used, the original power of the head unit will increase by up to 150 percent. Distortion of frequencies is highly decreased as well, generating clear and crisp sound which is best for distortion-sensitive ears. Alpine KTP-445U Four Channel Amplifier is also constructed with accessible front and rear gains. Unlike other amplifiers, it is designed with a low noise floor. This eliminates external interferences, resulting to the best signal and noise ratio. To enhance your crossover points, this unit gives you different ranges including 60 hertz (Hz), 80 Hz, and 120 Hz. This makes it compatible to different types of speakers. Configuration of inputs is even hassle-free, for you no longer have to use Y adapters and determination of source inputs is easier. The compact size of the unit makes its fitment ideal for any vehicle. Usually, it is installed at the back of the major unit. The best car amp for the money requires you to know more about the product. The car amplifier reviews are not enough if you cannot eliminate other units in the list wisely. You could do this by categorizing the amplifiers, preferably by weighing the advantages and disadvantages of each product type. Before you declare the best car amplifier for you, you have to know more about their different types. Here is the break down. 1) Mono Channel – From the name itself, it supports just one channel. This amplifier is also considered class D, but could generate more power than the multiple channel ones. There are various transistors in this amplifier type, but these components could either be on or off. If you have chosen this as your best car amplifier, anticipate that there will be tons of crossover distortion, but a smoother sound will still be produced since a filter is present. Note: If you are looking for the best 4 channel amp, this is obviously not the right type of the unit. 2) Two Channel – Products under this category are made by the best car amplifier brands if you prefer cost-effective units. It makes use of dual full-range speakers in the rear or front. Generally, you could find it with class A or AB circuitry. 3) Three Channel – This is described as dual amplifiers in one unit. The circuitry in this amplifier is a combination of class D and AB. If you do not have extra space in your car, this is a great choice. This is a good product for those who are driving two-door vehicles or small trucks. 4) Four Channel – If you want to power up the sound of speakers located on the front right or left and rear right or left, this is a good amplifier choice. This is also ideal for cars that have no rear speakers. 5) Five Channel – This is an amplifier that promotes hassle-free installation since even the cables are contained in a single area. If you have limited space, five channel is also useful. It has a subwoofer-powering mono amplifier and independent four channel circuitry. 6) Six Channel – This type of car amplifier is often used in marine environment. It is capable of powering a wake tower or boat speakers. Good amplifiers are not difficult to find. Fortunately, with different trustworthy brands around, your selection of best amplifier for car will be faster. You simply have to look into important aspects and confirm if a product is compliant to your basic needs and personal preferences. Wattage – You do not need good car amps that could blow up the interior while you’re playing your music. This will cause ear strain, and can cause more damage to the listener’s hearing overtime. Be realistic in buying a car amplifier without overdoing it with a minimum requirement of 15 watts. Power – Find an amplifier that is producing at least 75 to 150 percent of root mean square (RMS) of the speakers present in your vehicle. Technology – You will find the best car amp brands promoting advances in technology, including the tube sound quality. Besides this, you may still select from digital or solid-state sound production. Simply use your ears to judge which of the options is best. Distortion – This is produced by the speakers, power amplifier, and preamplifier. You must find the best monoblock amp or multiple channel units with crisp and lively sound. Additional Features – It is considerable to find the best stereo amplifier with extra built-in effects. Instead of focusing on volume or tone only, you may also try effects for delay and reverb. Getting the best amp for subs in your car’s sound system requires proper installation. There may be do-it-yourself best amps for cars, but the setup should still be done with professional assistance. By doing so, you will eliminate the possibilities of wrong wiring or placement resulting to poor sound distribution in the car’s interior. 1) Check the Specifics of Placement – There are various factors you need to consider before installing any of the best car audio brands in your vehicle. Examine your car first for proper size of ground wire, power wire, and fuse. You should also find it manageable to pass the power wire from the battery to the firewall of your vehicle. Even the top car amplifiers require proper signal wiring and speaker connection to the amplifier. Lastly, there must be enough space for mounting the main device. 2) Use Cooling Fans – Similar to any audio device, amplifiers also generate heat. You should ensure that the amplifier is mounted up high to ensure sufficient airflow and resistance against damage. 3) Disconnect Positive Battery Terminal – Before you proceed to the wiring of car amplifier, you should detach the positive battery port first. Alongside this is checking the components that may be affected when drilling. 4) Ensure a Good Ground Connection – Upon installing the amplifier, you have to link the ground wire to a car chassis metal point. It is best to establish a connection to a bare metal. You may use a sandpaper or filing material to get rid of rust, paint, and dirt from the surface. 5) Install the Inline Fuse Correctly – It is recommended to setup the inline fuse into the main power wire. A solid structure is best for mounting the holder. If you can, install the inline fuse at the nearest location to the battery for the protection of your vehicle’s electrical system. Enhance the sound system of your vehicle without changing its existing OEM receivers by selecting the best car amplifier. If the given list above is your basis, the best choice is the BOSS Audio R110M Riot Monoblock. 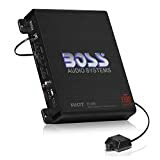 BOSS Audio won in a lot of ways compared to its rivals. Primarily, it has 2 ohms stable feature, which promotes more power particularly at high volumes of music. You also have the guarantee of great quality sound with its class AB amplifier circuitry. Distortion is easily eliminated with the advantages of flexible high or low-level inputs. The amplifier does not even lack in terms of protective features. It has MOSFET technology, requiring reduced current to work. Even if the unit gets too hot, it will automatically shut off. Follow the guidelines in the proper installation and use of the best car amplifier, and you will not encounter problems with your newly purchased unit. In case you still want to look for the best amp brands, you may simply keep in mind the purchasing tips and aspects to prioritize.